How chuffed to be included in the groundbreaking Thames & Hudson book The Planthunter: Truth, Beauty, Chaos and Plants by Georgina Reid with photographer Daniel Shipp. Such an avid reader of The Planthunter and seeing how these two are gently and persuasively changing the face of gardening in Australia. Edna Walling almost a century ago burst onto the scene in Australia changing gardens from ‘look at me’ display gardens to places that were meant to be lived in, to be enjoyed, to sit in and not just to display and work slavishly in. Georgina and Daniel are taking this one step further in showcasing people and places that are not resolutely following fashion or trends. The Planthunter shows their ultimate respect for Mother Earth, for the environment, for integrity and reality, for celebrating people and places that nurture, that are nurtured and that express each owners individuality. Rather than a book of immaculate gardens, it is a book as much about the people as the spaces they inhabit. Eclectic, individualistic, eccentric, soulful, challenging, whimsical and each in their own way engages on different levels - artistically, academically, horticulturally - all totally individual and inspiring. Read David Holmgren’s chapter on leading a revolution on living more in tune with nature; Bill Henson on art, evolution and beauty; Thomas Woltz’s vision; D’Harawal woman of the Bidiagal clan, Fran Bodkin on indigenous knowledge of the natural environment; the London lawyer Leslie Bennett writing papers for the US Department of Agriculture on farming practices who now spends her days designing and tending gardens that are productive and beautiful…and be taken through all these journeys by the superb images of Daniel. Follow The Planthunter, Georgina Reid on instagram here, Daniel Shipp here and read more about the book here. Such a privilege to have one of my Monaro images on front cover of good friend Charles Massy's new groundbreaking book Call of the Reed Warbler which is such an inspiring read and has been reprinted many times since its recent publication. Look for talk at a writers festival or other venue by the author who is in strong demand as public speaker. Published by University of Queensland Press and in the US by Chelsea Green. Armidale ADFAS (Australian Decorative and Fine Arts Society) lecture on February 6, 2019. Allambee Club, Yass Guest Speaker Thursday 7 March. Glenmore House ‘Dreamers, drifters and dilettantes in the Mediterranean’ Friday 15 March. Speaking at Jugiong Writer's Festival Saturday 23rd March. Friends of Royal Botanic Gardens Melbourne lecture Thursday 2 May. ADFAS (Australian Decorative and Fine Arts Society) Lecture in Armidale on 6 February 2019. Was such huge privilege to travel back to Armidale for an ADFAS (Australian Decorative and Fine Arts Society) lecture on February 6, 2019 where many many friends among the 240 people attending. This followed on from two ADFAS lectures in Melbourne last year: Contemporary Landscapes - illustrated lecture which looked at some of the most innovative and inspiring landscape designs in the world - from the Greek Islands, to Italy, through to France, South America and throughout Australia - large gardens that cover an entire island to intimate town gardens, cutting edge gardens from some of the world’s leading landscape designers and garden makers. 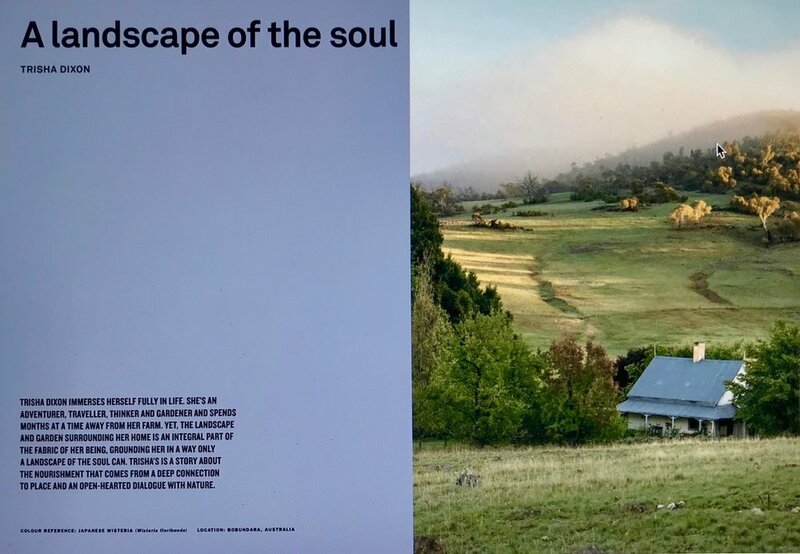 Had the very great pleasure of having the Plant Hunter, Georgina Reid and photographer Daniel Shipp to stay here at Bobundara for a few days while on the scout from Melbourne back to Sydney…and chuffed to be included in Georgina's book. Interview with Sophie Hansen and Skye Manson, My Open Kitchen Podcast Series 2, Episode 3 January 31, 2017.